The recent massacre and siege by Islamic militants at a shopping mall in Kenya does not quite fit the Bloodbath Formula which I use here to correlate with purposeless mass murders and murderers. The astrology does not quite line up, and the killings, while tragic and extremely misguided, are not purposeless (which in no way implies that all purposes are good). 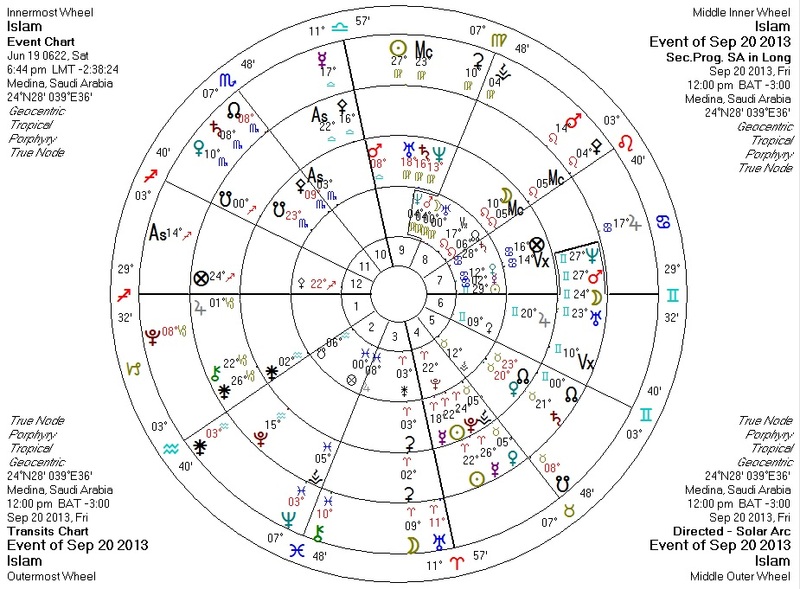 To understand the astrology behind the event, we must look elsewhere. In an earlier post, I provided quite a few examples of planetary transits involving Pallas which signal the experience of an ethical crisis. Because this event is largely religiously motivated, we might look for Pallas patterns in the current astrological weather for the religion in question. Pallas represents ethics and logic in general, and the libertarian non-aggression axiom in particular. When ethics and aggression are involved, Pallas is always somewhere in the astrological picture. This is a mix of elements some of which strengthen Pallas and others of which weaken her. The sheer number of elements here in any event suggest that Islam, if treated as a singular entity, is undergoing a pronounced crisis of ethics, particularly regarding the use of force and violence. With all the Nodal activity here, one might expect a renewed commitment to non-aggression to arise in the more moderate adherents to the religion. The US might help by quitting its habit of aiding Islamic militants and allowing the more moderate elements to reassert the control they had before the US started its intervention program.